Getting caught with a stolen gun can put you in a tricky predicament. The last thing you want is to have your gun confiscated and go through endless amounts of red tape to retrieve it from law enforcement. Do not put yourself at risk and follow these tips to avoid being caught with a stolen gun. Why is it important to verify guns? There are thousands of stolen guns in the United States and they are in extremely high demand from criminals up to no good. The person who has the potential to be hurt the most is the law abiding gun-owner who was made an unsuspecting buyer of a hot gun. When the number of stolen guns increases, the number of crimes committed will increase as a result. The percentage of stolen guns that are used in violent crime is significant and criminals are looking for any manner to get their hands on a weapon. Out of 1,260 stolen Florida guns in 2016, 572 were reported from burglaries, 87 from larceny, and 3 by robberies. Remember, criminals cannot pass a background check for a gun and they might even attempt to purchase a gun from you if they cannot steal one. How to Check if A Gun Is Stolen? There are several databases you can check on your own to gain a quick look to determine if the gun has been stolen. Some require you to contact law enforcement and they can run the serial number through their database. If you would rather check for yourself, there are free online databases you can run your gun’s serial number. The National Crime Information Center works with law enforcement agencies across the country to obtain stolen property. Any criminal justice agency can enter a gun’s serial number and obtain immediate feedback about the gun in question. If the gun is confirmed stolen, law enforcement can act to search and seize it. Stolengunz.com allows gun owners to inform others in the community that their gun has been stolen by entering its serial number. After informing law enforcement a gun has been stolen, members of the site become aware of the stolen gun. Anyone who recovers a stolen gun will need an account to inform the gun owner of their gun being located. The hotgunz.com stolen firearms database collects data on tens of thousands of guns all across North America. Once the gun’s serial number has been entered into the database, members of the community can be on the lookout for it. Users of the site can contact the gun owner if they come across a gun that is reported stolen. The most effective way of limiting gun theft is to properly secure your gun. It is wiser to lock your gun inside your home rather than inside your car. If you must keep your gun in your car, then make sure your car is locked. Law enforcement officials highly recommend guns not be left in vehicles due to the increase of theft inside vehicles. Guns should be kept inside a locked compartment inside the car if needed to be kept inside the car. In many large cities, vehicles are becoming the most popular target for criminals. If you keep your gun inside your home, then secure it inside a safe. Always lock your house whether you are home or out of town. A stolen gun is not only a safety hazard for the individual household, but for the community at large. Stolen guns are frequently traded or sold in the black market to commit violent crimes. Stolen guns cost the victims of theft a substantial amount of money whether they are a private citizen or a federal firearms licensee. Criminals who steal guns become more emboldened to steal after every successful gun theft. If their theft attempts were unsuccessful, then the likelihood of further criminals attempting to steal guns would decline. Who is most at risk for experiencing gun theft? Individuals who do not store their guns in a safe and secure location, carry their guns outside of their home frequently, and own multiple guns are at a higher risk of experiencing gun theft. What to do if your gun was stolen? Whether you are a private citizen or a Federal Firearms Licensee, contact your local law enforcement agency so they can quickly use their resources to track activity on the stolen gun. If no crime has been committed with the gun, then inform law enforcement of possible inventory errors. If you are a Federal Firearms Licensee, call the ATF’s Stolen Firearms Program Manager toll free number at 1-888-930-9275. The ATF can work in cohesion with your local law enforcement in the recovery process. Report ATF Form 3310.11 must be completed and sent to the ATF National Tracing Center. If you are a private citizen, enter the serial number of your gun into online gun search communities such as Stolen Gunz or Hot Gunz. This will let other law-abiding gun-owners know of your missing gun. 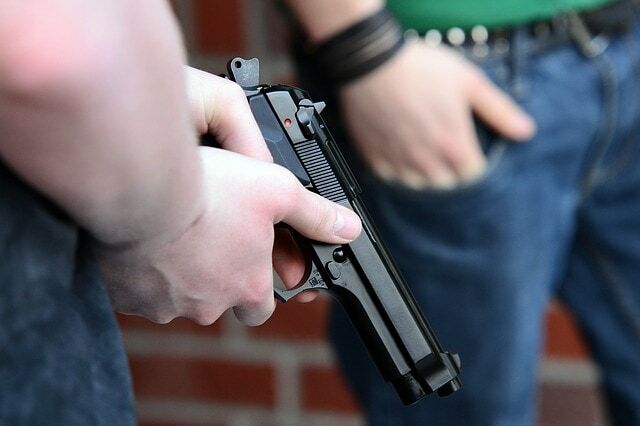 Constantly check with the police for information on the whereabouts of your stolen gun. Burglaries of licensed gun dealers increased 48 percent and robberies of licensed gun dealers increased 175 percent from 2012 to 2016. This led to 31,500 guns to be stolen from gun stores within the aforementioned years. The state of Texas had the highest total of stolen guns in the United States from 2012 to 2016 (see table below). It is estimated that approximately 200,000 to 400,000 private citizens experience gun theft every year. According to the FBI, $164 million worth of guns were stolen across the United States in 2015. Gun theft has been shown to be on the rise in the United States and it is a genuine threat to public safety. If private gun owners and gun stores practiced more diligent gun storage practices, it would lower the number of gun thefts in the country. Without appropriate action, more and more guns will end up in the hands of criminals instead of law-abiding citizens.